Lukasz Swiatowski vs. Grzegorz Kowalski, photo: Radoslaw Dyduch. 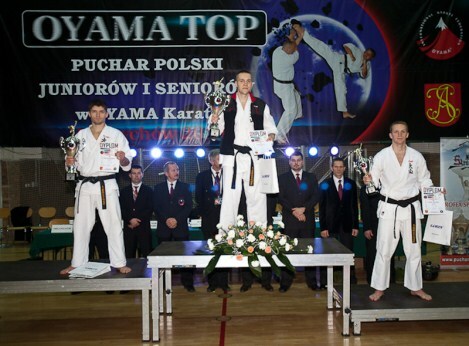 Between November 19-20th 2011, OYAMA Polish Karate Federation organized its 12th OYAMA TOP-Polish Open Oyama Karate Cup in knockdown and semi-knockdown. Tournament took place in Andrychow. 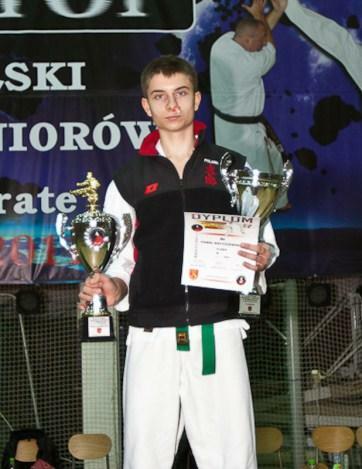 The event was organized by Malopolski Klub Karate and its leader Sensei Jacek Kasperek 3rd dan. Mr Tomasz Zak, the Mayor of Andrychow and Hanshi Jan Dyduch 8th dan, the president of OYAMA PKF took patronage over the tournament. 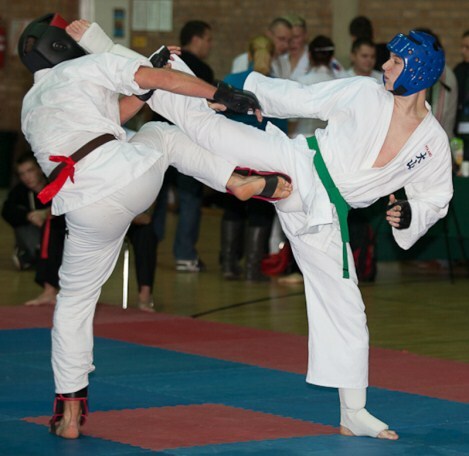 Around 270 female and male fighters, representing 40 Oyama karate clubs, 2 Kyokushin Tezuka Group an 1 Kyokushin Matsushima, took part in Polish Cup. Saturday morning started with senior semi-knockdown competition on tree tatami. Same day, afternoon was reserved for prestigious OYAMA TOP-knockdown tournament. Sunday was planed for the Junior Polish Cup in semi-knockdown competition. The opening ceremony was conducted by Mr Tomasz Zak, the Mayor of Andrychow and Hanshi Jan Dyduch. Chairman of OYAMA PKF sincerely thanked the city officials for organizing the Cup as well as for an honorary patronage. Hanshi Dyduch presented his gratitude towards the host of OYAMA TOP – Sensei Jacek Kasperek 3rd dan. Shihan Andrzej Pierzchala 6th dan, OYAMA IKF director of schooling division was also present during the competition. 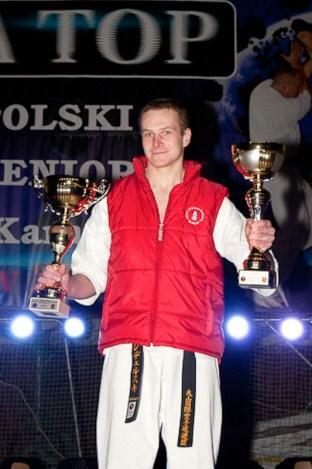 Shihan Pawel Pajdak 5th dan (Sosnowiec) was the head referee. The duties of the field referees were fulfilled by Shihan Witold Choinski 5th dan, Shihan Eugeniusz Stanislawek 5th dan, Sensei Rafal Majda 4th dan, Boguslaw Plewka 4th dan and Sensei Mariusz Pawlus 3rd dan. The competition was at very good sports and organizational level. The winners of the OYAMA TOP category received impressive cups and financial prizes, sponsored by OYAMA Polish Karate Federation. 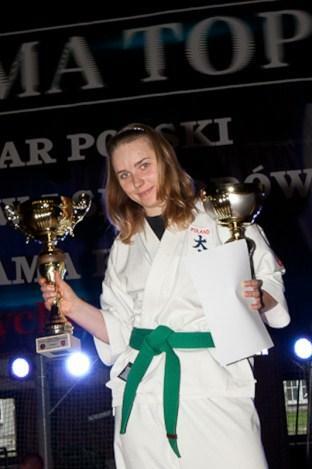 The Cups for the Best Fighters of the OYAMA TOP went to Anna Kolodziej-Plewka from Lubliniec and Jacek Mazurkiewicz from Krakow. During the artistic part of the tournament a karate team of youth from Lubsko gave an excellent display of their skills. The tournament was well organized and conducted with full coverage of regional journalists.